Krav Maga Mama: Can You Identify a Safe Person from an Unsafe One? Last week I volunteered for another women’s self-defense seminar at the Worldwide Krav Maga center. This is the third one I participate in, and however menial my tasks may be when I am there—for I’m not even close to being an instructor—I always leave with the feeling of having accomplished some sort of purpose in life. Perhaps it’s the reassurance that in some small way I feel like I am able to do something for these women what I was not able to do for the special women in my life who were hurt by unsafe relationships. I see some of these ladies coming in with their heads bowed low and watch them leave with their heads held high, because they now have tools they can use to prevent a possible attack. How does this apply to relationships? I wondered. After all, there are countless of women who come here who were married to abusers tell me that they never had a single clue that this person was unsafe; which prompted me to write about this very issue for this month’s blog post in remembrance of V-Day (Violence against women). First of all, let me start by saying that I am in no way considered an authority by any means, and I am merely sharing some of the things I have read about choosing safe relationships. Character discernment doesn’t always come easy for any of us. We are told when we are children to play nice, forgive and get along, but we are oftentimes not given the skills to determine if the people in our lives are safe for us, especially if we come from dysfunctional home environments where we learn to normalize certain unsafe behaviors. There are, however, some early signs and red flags that come up at the beginning of a relationship to find out if this person is safe or not. 1. Unsafe people think they have it all together instead of admitting their weaknesses. While it is perfectly normal to have a certain shred of confidence, these people never have any needs and have a tendency to show contempt for those who do. 2. Unsafe people are religious instead of spiritual. They base their relationship by a set of legalistic rules one must follow as opposed to focusing on building and strengthening relationships. For most women, the demand to submit under his authority is often used as a weapon and excuse to meet his needs first. 3. Unsafe people are defensive instead of open to feedback. Safe people own where they are wrong and are responsive to change. The opposite occurs with the unsafe one. 5. Unsafe people only apologize instead of changing behavior. These people oftentimes expect forgiveness without self-examining the addictive patterns that keep driving them to apologize because they never change the behaviors. 7. Unsafe people demand trust instead of earning it. They get defensive or angry if someone questions their actions without ever proving themselves trustworthy. 8. Unsafe people believe they are perfect instead of admitting their faults. Projecting an image of perfectionism is what drives this person. 9. Unsafe people blame others instead of taking responsibility. Denial is the active process that this person uses to avoid responsibility. Abandoners- They “prefer shallow acquaintances over true closeness” and start a relationship but can’t finish it. Critics- They are judgmental, speak the truth without love, and have no room for grace or forgiveness. 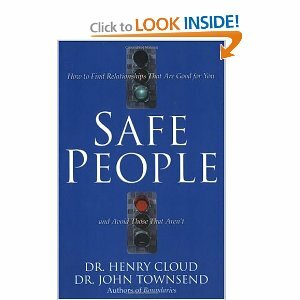 Perhaps we've been involved with or even raised with unsafe people. We might even see ourselves in some of these traits, after all, we are all imperfect and we all pick things up from life experiences that may have made us that way. But the danger lies when there is an unwillingness to change, grow and strive to be a better person. These headstrong behaviors will continue to hurt the people we love when this happens. This book is an excellent read. Another great resource is, "Why Does He Do That?" by Lundy Bancroft. These two books are both great resources for creating awareness about unhealthy relationships, and it gives insight about the red flags that may sprout at the onset of a relationship to help keep you safe, both physically and emotionally. If you know of other resources regarding this topic, please feel free to comment below. Till next time. Stay Safe! *If you enjoyed reading this, feel free to subscribe to this blog.